The Centralia Panthers and Olpe Eagles are set for a rematch of last year’s playoff game. Centralia won last year’s meeting 28-0. Centralia is led by its rushing attack, which produces 359.8 yards per game. Senior Sam Steinlage leads the Panther attack with 1,057 yards and 20 touchdowns on only 92 carries. Quarterback J.T. Rosine has run for 838 yards and 12 touchdowns on 87 carries. Centralia defeated Oskaloosa 56-8 last week. The Panthers’ closest game all season was a 16-0 win against St. Marys in the season opener. The Panther defense has allowed 46 points all season. Olpe opened the season with an 0-2 record after losses to 3A playoff teams in Sedgwick and Wellsville. The Eagles are 7-1 since then and almost pulled off an upset against Lyndon on Oct. 4. Olpe fell 27-25 in that game after missing a late field goal. The Eagles defeated Wabaunsee 21-13 in the first round of the playoffs. Wabaunsee led Olpe 13-7 at halftime. Isaac Hall, Andrew Burenheide and Bo Krueger each scored touchdowns for the Eagles. Olpe bounced back after a disappointing start to the season, but the Eagles will have a difficult time getting past a Centralia team that is poised to get back to the state title game. Undefeated Lyndon will travel up to Northeast Kansas to take on the Troy Trojans with a spot in the state semifinals on the line. The Tigers are trying to get back to the state semifinals for the second consecutive season after falling 34-14 to Centralia last season. Lyndon escaped a first-round upset bid by Northern Heights with a 49-44 win just a week after beating the Wildcats 36-0 to close out the regular season. Last Friday, the Wildcats and the Tigers exchanged the lead six times before Lyndon held on for the five-point win. Lyndon’s Josh Owens rushed for 215 yards and two scores in the win, but the Tigers once again played without injured quarterback Joe Walsh. Gage Brecheisen started under center and rushed for three scores and threw a touchdown pass. Walsh has thrown for more than 1,300 yards and 15 touchdown on the season. Owens is a 1,700-yard back with 23 scores. First-year coach Derek Jasper has Troy in the state quarterfinals after defeating McLouth 26-14 in the first round. Derek Franken rushed for 86 yards and a touchdown and Tristan Speer added 78 yards on the ground and three scores for the Trojans. Speer took over as the Trojan quarterback mid-way through this season after becoming eligible after transferring from Doniphan West. He has passed for 513 yards and six touchdowns and rushed for 300 yards and seven scores. Franken leads the Trojan offense with 445 yards rushing and six touchdowns, while Colton Masters has carried a team-high 77 times for 324 yards. Troy’s defense is led by junior linebacker Jay Whetstine who averages more than 11 tackles per game. This could be seen as a trap game for Lyndon, especially if Walsh doesn’t play. Troy’s last trip to the quarterfinals ended with a 30-21 loss to Sedan in 2004. The Trojans have never reached the state semifinal round and although the Tigers are the favorite, don’t be surprised if Troy advances at home. Last year, these two teams matched up in the second round in La Crosse and the Leopards won 20-8. A year later, both teams have plenty of talent, but in different ways. La Crosse has Kansas’ No. 1 return man in Andrew Jay, who leads the state with 660 return yards, 1,724 all-purpose yards and three non-offensive scores. 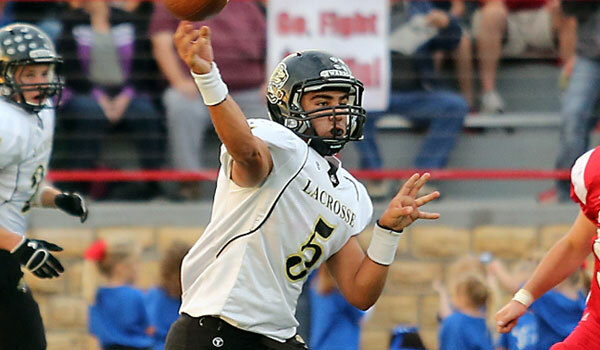 Quarterback Jack Garcia has completed 71 of 127 passes for 1,735 yards with 26 scores against six interceptions. However, Oakley has the state’s No. 1 scoring defense at just 27 points allowed and a strong defense line anchored by junior nose guard Ryan Kuhn. Senior running back Key Keller has 37 carries for 364 yards and seven scores in the last two contests. Plus, Oakley has extra incentive of playing for coach Randall Rath, who has announced his resignation after 24 years with the school. playing well recently in key games against Sterling and Plainville. The Leopards keep in close, but Oakley is clicking right now and has the home field advantage. The two teams met up in the 2008 and 2009 playoffs in two games that became famous in the Smith Center era. The first meeting, a 60-14 Redmen victory, was win No. 66 in Smith Center’s eventual state record 79-game run. The second one, a 10-0 Smith Center victory, marked Coach Roger Barta’s career win No. 300 and was win No. 78 in the streak. Barta retired after last season following 323 victories and eight state titles. This time, coach Darren Sasse, in his first season as head coach after a longtime run as junior high coach, has led the Redmen to a solid season behind a big senior class. Meade, the defending Class 2-1A state champions, is No. 1 in the classification with 513 points. Jett Little leads Meade with 1,230 rushing yards and 28 scores with 701 passing yards and 13 TDs. Smith Center ranks No. 4 in scoring defense at 116 points. Senior Clint Rogers has rushed 107 times for 938 yards and 11 scores and Grant Lambert has 98 carries for 654 yards and 11 TDs. Meade has enough offense and Smith Center has to make a long trip to southwest Kansas.